This smokey Slow Cooker Chipotle Chicken Soup comes together in just minutes, making it one of the easiest – and most delicious! – meals you can prepare any night of the week. Original content posted January 2014. Updated March 2019. What’s cooler than being cool? Ice cold! Or rather, more than half the country including my beloved city of Cleveland. We woke up to a temperature of -8 and a windchill of -40. ACK! 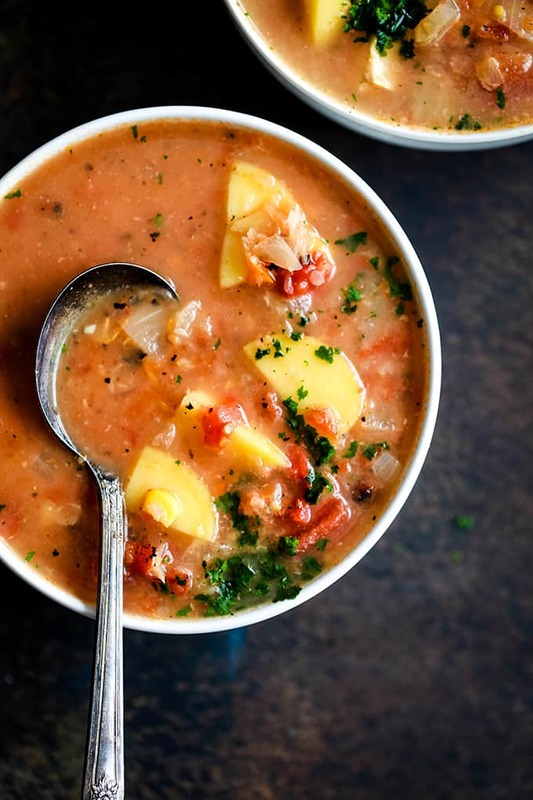 If there’s any day that soup should be on your menu, it’s today! This Slow Cooker Chipotle Chicken Soup is warming from the inside out. Smokey chipotle pepper mingles with chicken and an abundance of fresh veggies for the perfect bowl that will make you momentarily forget the ridiculous temps outside your window. Soup season is the best season, I always say! Don’t let the name chipotle and the addition of both the pepper and adobo sauce cause alarm! My five year old is resistant to all things spicy and she never once mentioned any heat in this dish. In fact, all three little ones in my menagerie happily ate their bowls. If you like a little more smokey flavor, try stirring in an additional teaspoon of adobo sauce at the end of cooking time. I know I wouldn’t complain! You know what I love to serve with this Slow Cooker Chipotle Chicken Soup? Cornbread! Specifically my Simple Sweet Cornbread as I love the contrast of the hint of sweet from the cornbread and the smokey flavor of the soup. It’s a winning combination. My Cheddar and Cream Cheese Skillet Cornbread is also delicious served alongside this chipotle chicken soup recipe. In the fall, I especially love my Pumpkin Cream Cheese Skillet Cornbread. And although its absolutely delicious – if I do say so myself! 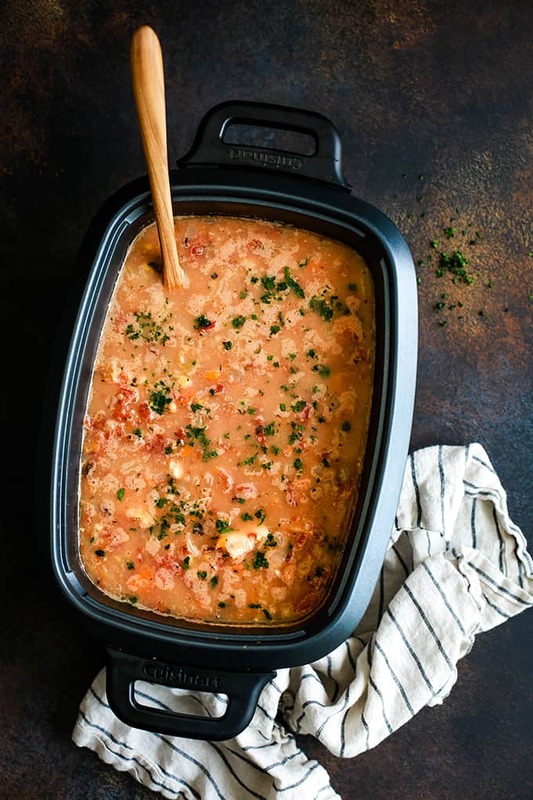 – I love it even more as this Slow Cooker Chipotle Chicken Soup is one of those recipes where you simply add all of the ingredients into your slow cooker and walk away. Once you’ve done the prep in the morning, it’s hands off until dinner time. It makes your house smell pretty fantastic, too! 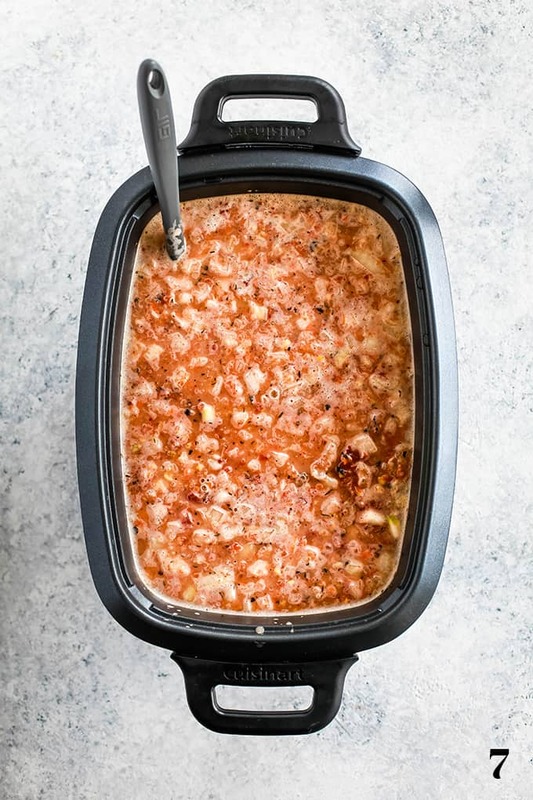 Combine all ingredients from onion through minced chipotle pepper in six quart slow cooker. 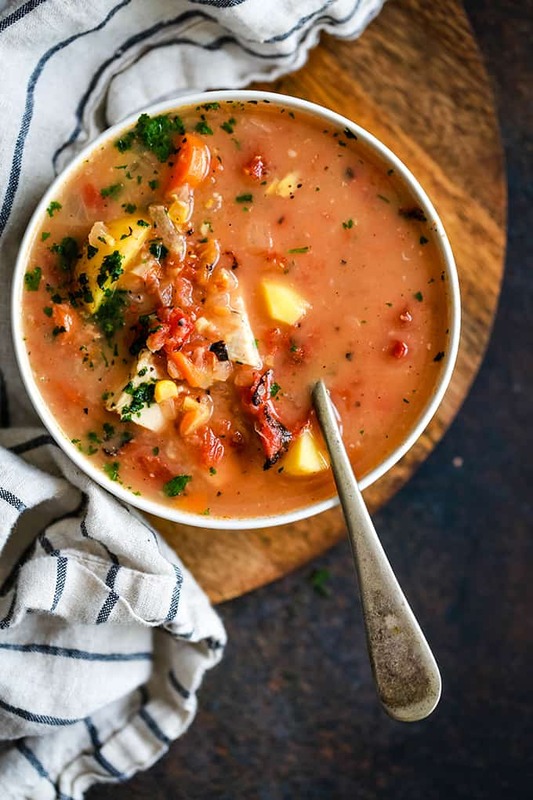 Add fire roasted tomatoes and chicken broth to slow cooker. Nestle chicken breasts into slow cooker. Cook on LOW six hours. Remove chicken and cut into bite size pieces. Using an immersion blender, blend half of the soup within the slow cooker. Return chicken to slow cooker. TIP: Don’t have an immersion blender? Instead, you can transfer your soup in small batches to a blender or food processor and puree to desired texture. You’ll want to insure you don’t fill your blender or food processor too full to avoid burning yourself – and making a huge mess! Add heavy cream and additional teaspoon of adobo sauce. 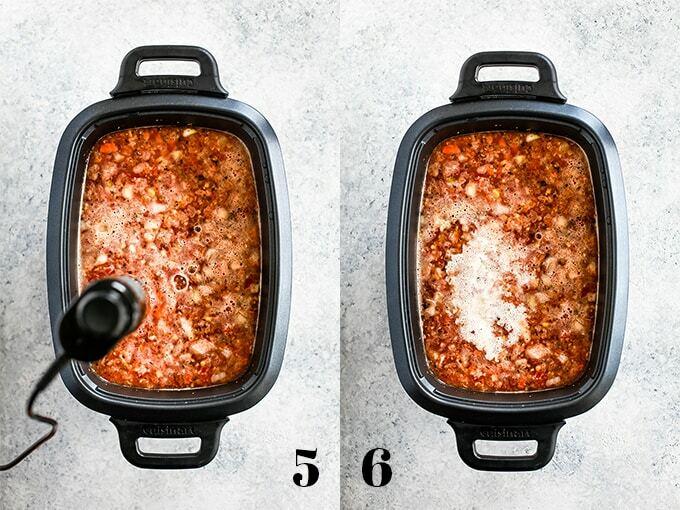 TIP: Want less heat? You can omit the additional teaspoon of adobo sauce although I recommend tasting the soup at this point before doing so. That smokey flavor is everything! Stir together to combine and cook on HIGH an additional 30 minutes. If you’ve tried this Slow Cooker Chipotle Chicken Soup or any other recipe on Melanie Makes, please let me know your thoughts in the comments below. I love hearing from you and respond to each and every comment! This smokey Slow Cooker Chipotle Chicken Soup comes together in just minutes, making it one of the easiest - and most delicious! - meals you can prepare any night of the week. 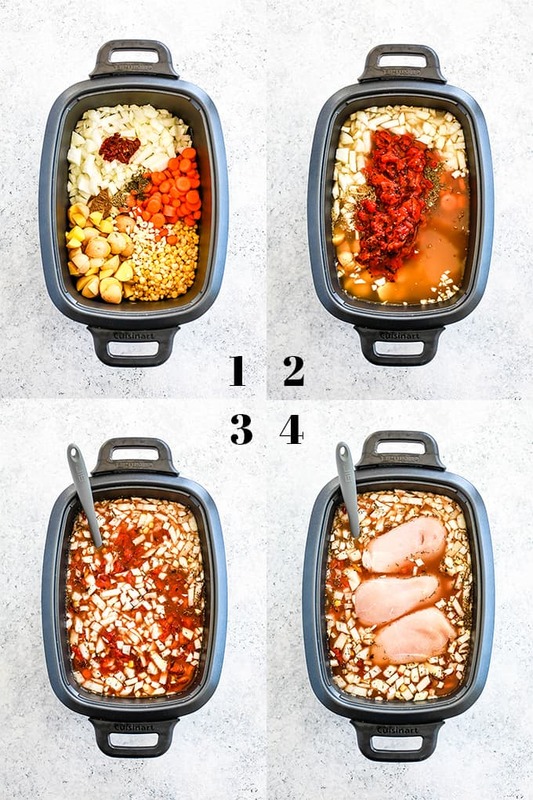 Nestle chicken breasts into slow cooker. Cook on LOW six hours. If desired, garnish each bowl with chopped cilantro prior to serving. Looking for other smokey dishes to add to your menu plan? You’ll definitely want to try these Chipotle Lime Shrimp Bowls, this Instant Pot Chipotle Shredded Beef and this delicious Grilled Chipotle-Orange Salmon. It looks so comforting! Would love to give this a try! This couldn't look any more perfect! This is seriously making me hungry! This soup looks really good. I should put it on my menu next week! 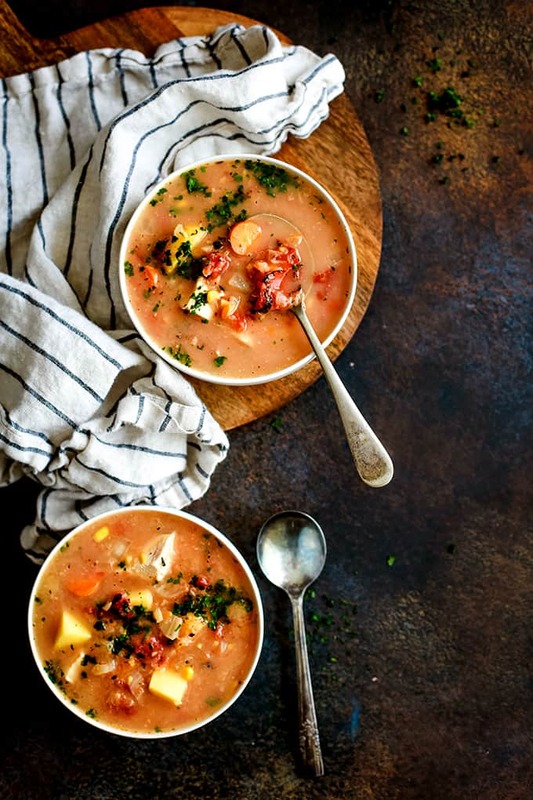 LOVE the flavors in this soup! Yum! This was delicious, my new favorite soup! 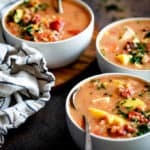 Wow!Nice post to share slow cooker chipotle chicken soup I so enjoy your site and your recipes. Would you please consider adding a print option so we can enjoy your recipes a little more easily. I really wish I liked sweet. Thank you so much. 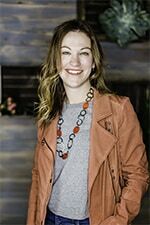 Hi, Jessica - thanks for your kind words! There's actually a print recipe button at the top of each recipe for you in a black box. Let me know if you don't see it! 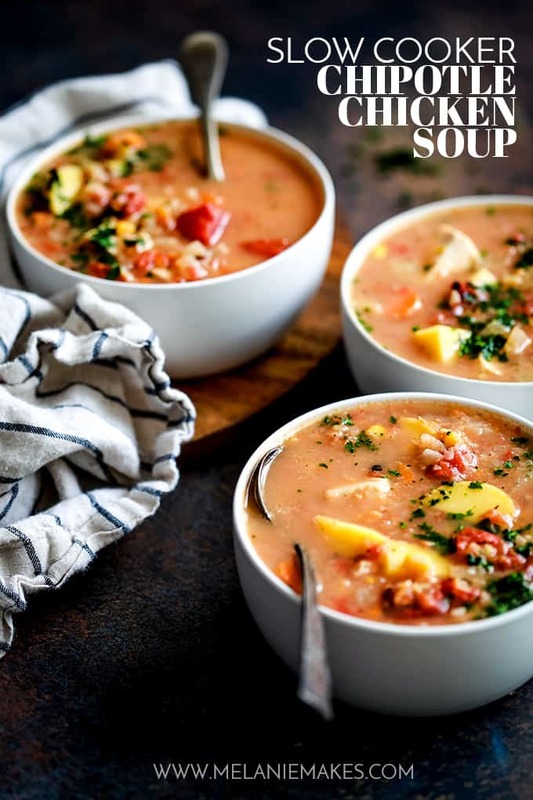 This is probably one of the best soups I have ever made- I highly recommend it to everyone! This recipie is a new favorite! You made my day, Chrissie! My favorite soup here! thank you for sharing! This shop looks delicious - so warm and comforting! There is nothing better than soup on a cold day! 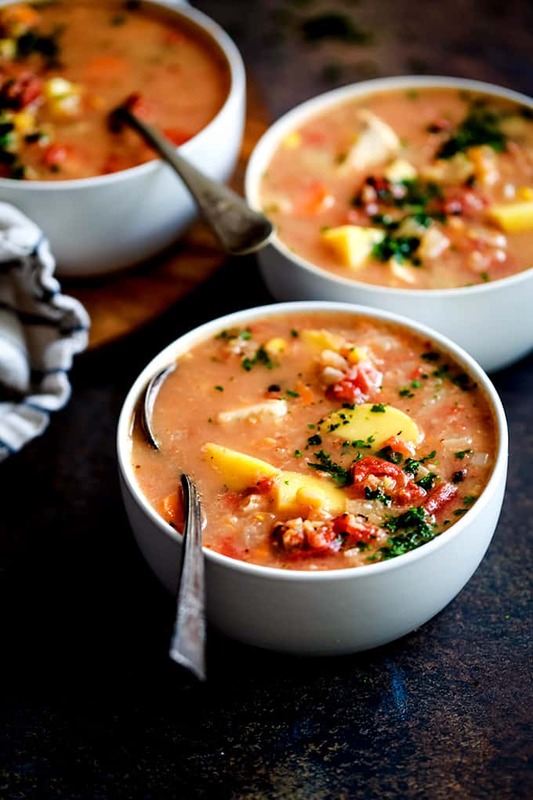 I love slow cooker soups! It's such a great treat after a long day. This looks so good, Melanie. Nothing better than a spicy bowl of soup to warm you up! I love that ingredient list - so simple! I'm always looking for ways to use more chipotles in adobo. Love the flavor and heat! I love soup, and chipotle chicken sounds amazing. My guys will be loving this recipe. I can basically smell it through DA SCREEN and I want to eat it all for dinner! You know what's lame? I haven't made a single soup this year. Clearly, that's changing. Pinned! YUM. Pinned it, need to make sure that the ingredients are in my hands the next time we're at the store so that I can make this over the weekend. YUM. YES! A perfect no fuss weekend meal! Let me know if you try it, M! This ones going on my menu for this weekend! It looks delicious. My family likes hominy. We are in Medina county, so, yeah, brrrrrr! Hello, neighbor! This is a perfect weekend dish - let me know what you think!